Even as music is constantly changing and developing with new genres and sounds, the classics never die. Around the world, there are still amazing bands out there keeping alive the energy that made famous some of the greatest times in music. Our friends from InCrest are taking that charge for the Grunge sound that dominated the late 1990s. Although it is rarely heard on mainstream radio today, the fans of hard rock and Grunge are still out there hungering for more. InCrest delivers! First off, how did the name InCrest come to be? Jonas Tange – Well actually we kinda didn’t come up with it ourselves. We started the band out as “Increast” in the sense of “becoming better”. We then played this gig and the pronouncer said “get your hands together for our new rock n roll guests from Copenhagen, here comes Increst”. Even though mispronounced, we really liked the sound of it, and it stuck on. Especially for the meaning we gave to it. For us, it means “inside the crest of the highest peak” thereby shortened to “In” the “Crest”, InCrest. How did you three first come together to form the band? Malte Slywest – Well me, Jonas and Anders met each other on a boarding school in our sweet sixteens. Me and Jonas formed the band with our prior bassist also by the name Jonas. We played together for some years, but after a while, something just didn’t click, and bassist Jonas left the band. Our really good friend Anders stepped in and became the new leg on the tripod and new bass player in the band. It has just been a solid rock-party ever since. Jonas Tange – That was actually when we renamed the band to InCrest as a sign of the new third member and new direction. How would you describe the InCrest sound? Jonas Tange – Our sound has been on quite a journey, ranging from garage rock to progressive metal to land on where we are now. I think the best description of it is somewhere in the alternative indie rock genre, heavily infused with a grungy 90’s vibe. Which bands have had the biggest influence on you? Anders Hagedorn – The biggest influencers through time, has probably been the 90s Seattle bands such as Pearl Jam, Nirvana, Foo Fighters, Alice in Chains and Soundgarden. But prog bands like Tool, Deftones and Porcupine Tree has also left a big mark on our early sound which especially can be heard on songs like “Strangest World” and “100 and Ten”. Malte Slywest – I think Dave Grohl from Foo Fighters and Nirvana always was my biggest idol. One thing is his brilliant approach to music composition, but what I really love about him, is the energy and commitment he puts towards the world of rock music. There almost is an enchantment surrounding him and everything he touches. How does a song come together for you guys? What is your songwriting process? 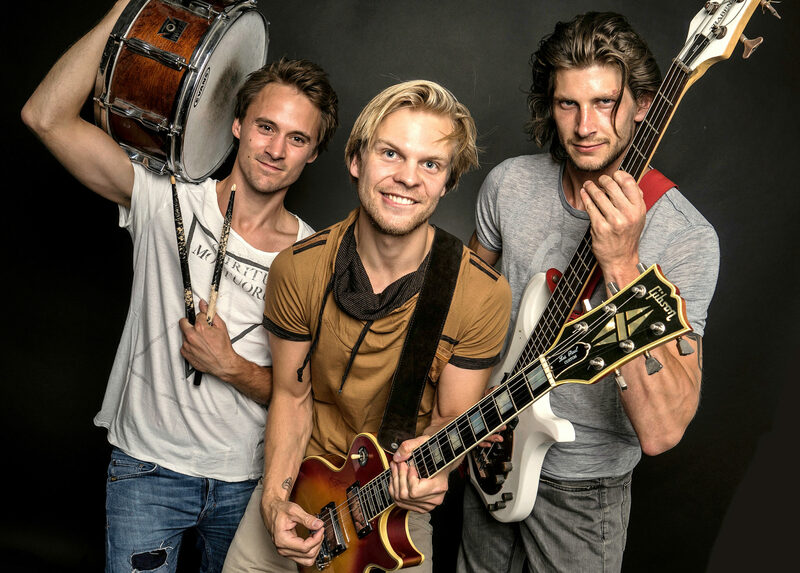 Jonas Tange – We’ve almost used the same approach for all of our songs. Malte is the main composer who comes up with the idea and foundation of the songs with a combination of guitar riffs and vocal melodic phrases stitched together to form the songs, following up with the fine-tuned lyrics, which is then recorded for a basic demo. Then Malte presents the songs to me and Anders. From there we select whether or not we should go further with the songs and evaluate if they fit into our band’s music vibe. If they do I lay down a drum track and Anders figures out some bass notes, with the influence of Malte. Lastly, we introduce backing vocals and such. So the second half of the songwriting is a very collaborating phase. Your newest album The Ladder The Climb The Fall takes your sound to new heights. Tell us about the album’s development? Malte Slywest – Thank you. Well the new album has actually been 4 years on the way. We began working on it even before “Rubicon Atlas” was fully released. And so it’s been a pretty long process. Here is where it gets interesting; the concept of the title and theme on the record “The Ladder The Climb The Fall” is, in fact, build upon a specific Game of Thrones speech made by a character called “Littlefinger”. It states that chaos is a ladder. You either climb the ladder for eternity while fighting your way up the steps. If you don’t keep climbing you’ll slip and fall down, causing you to most likely break your spirit, with a high chance that you’ll give up. The other option is to not climb at all and cling on to the comfort of the realm, the gods or love. This I’ve interpreted into the corporate ladder or long and rough ladder to success. It’s an awesome theme for the album, with the title song “The Ladder” pretty much summing up the very concept it. It’s been a really exciting but rough journey. We recorded the whole album ourselves in our own studio. However we wanted to nail a better sounding record than our last one, and so I reached out to the manager of Matt Wallace, and American top producer, who’ve worked with Maroon 5, Faith No More, and Three Doors Down, asking him if he wanted to be involved. Lead single “Nightcrawler” seems to be a hit. Tell us about making the video? Anders Hagedorn – Oh boy, the Nightcrawler video. I think we were always pretty sure on making Nightcrawler one of the singles, so it seemed naturally it’ll become the first one to introduce the album. As mentioned Malte is the lyricist and main composer of the songs, which means he also comes up with the video concepts. This one was about losing yourself to your inner dark side. I guess you can compare it to the Star Wars transitioning of Anakin Skywalker becoming Darth Vader or something like that. It was a bit difficult finding a good spot to shoot it, where the settings was good and where we could bring the noise of a full drum set, without having a tornado of complaint hauling in from neighbors. It was actually a pretty fun shoot, until the mosquitos came that is. We had some friends coming in to play the dark side shadows. The most fun was probably the fight scenes which we had to speed up, due to the fact that we were laughing our asses off while we did it. I think the video has been a great success and very well received. What advice would you give to other grunge rock bands keeping the torch alive? Jonas Tange – I’d say right on brothers! As long as the Seattle vibe is being kept alive, we’re more than happy. Most teens running around with a Nirvana t-shirt nowadays, don’t even know their music, it’s just become a fashion symbol, with the sole song “smells like teen spirit” being the only thing people remember of this epic time. We’re here to remind people that grunge and rock isn’t dead and forgotten, and anyone else doing the same, is simply just making us proud and more energetic about this whole thing. What plans are on the horizon for InCrest? Malte Slywest – Right now we’re still focusing on the new release, working with the press and such. We’re also getting ideas ready for the next music videos, and planning tour dates for 2019. But it most likely won’t be long before we’ll dig into some more music creation as well, That’s for sure.